When Queen Mary 2 entered service in 2004, most first tier passenger ships only had one specialty restaurant. Accordingly, QM2 was equipped with the Todd English Restaurant, a specialty restaurant developed in conjunction with the celebrity American chef of the same name. However, since 2004, it has become common for cruise ships to have several specialty restaurants. The idea behind having an array of specialty restaurants is to give passengers more alternatives and more variety. Thus, in order to keep Queen Mary 2 at the forefront of the leading passenger vessels, it became important to create more alternative dining experiences on QM2. But how to create additional experiences without making structural changes to the ship? Cunard's solution was to look to QM2's King's Court buffet restaurant to provide the locale for an additional alternative dining venue. In addition to already having tables and chairs, this area had an existing galley where meals could be prepared. (A similar use of space has been successfully implemented on several of the Holland America ships where sections of their buffet restaurants have been converted into Canaletto Italian specialty restaurants). Still, even a portion of the King's Court could not be devoted to a new specialty restaurant on a full time basis. During the day, space is at a premium in the King's Court. Instead, the way it works is that each evening during a voyage, a section of the King's Court is transformed into an alternative dining venue. When daylight returns, this area once again becomes part of the buffet. Although the restaurant is physically located in the ship's buffet restaurant, this is not serve yourself. Rather, there is waiter service and a sommelier under the supervision of one of the ship's assistant maitre d's. The ship's dress code applies in the alternative dining venue so when it is a formal night, guests are expected to dress when they come to this venue. The name of the venue and the cuisine offered changes several times during the voyage. The restaurant is Lotus when it is serving an Asian-fusion menu. It becomes La Piazza when the cuisine is Italian. And it is Coriander when the restaurant becomes an Indian-inspired venue. 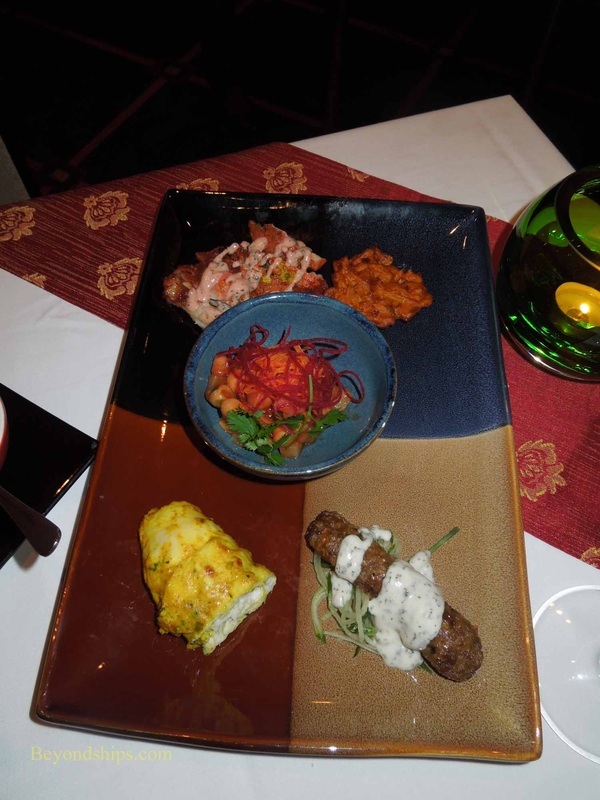 Thus, during the course of a voyage guests have the option of trying several different cuisines. We tried QM2's alternative dining during one of the nights when it was Coriander. Coriander does not attempt to compete with QM2's main dining rooms on the basis of ambiance. The Britannia Restaurant, where most passengers dine, is one of the most elegant and impressive dining rooms at sea. Done in a turn of the century style that soars up two-plus decks, the Britannia is reminiscent of the style of the Titanic and other floating palace ocean liners. The King's Court is essentially a cafeteria. Still, Cunard has made an effort to change the atmosphere of this space. The buffet lines have been screened off so that they are not visible from the seating area. Soft lighting and soft music also helps to create a more romantic atmosphere. In addition, included in this area are several glass-enclosed sections that project out onto QM2's outdoor promenade. These are physically separate from the rest of the buffet restaurant and before sunset, they offer floor-to-ceiling views of the ocean passing by and after dark, of the teak wood promenade deck. Whereas the Britannia is a big, grand room, Coriander is small and intimate. Above: Lamb Jalfrezi arrives in its cooking pan. Below: An array of side dishes. The main attraction of Coriander, however, is the food. You come here when you want something different than what is being served in the main dining room. As noted above, Coriander is an Indian-inspired menu, making it popular with British guests. Coriander's dishes are prepared for western tastes - - only moderately spicy. 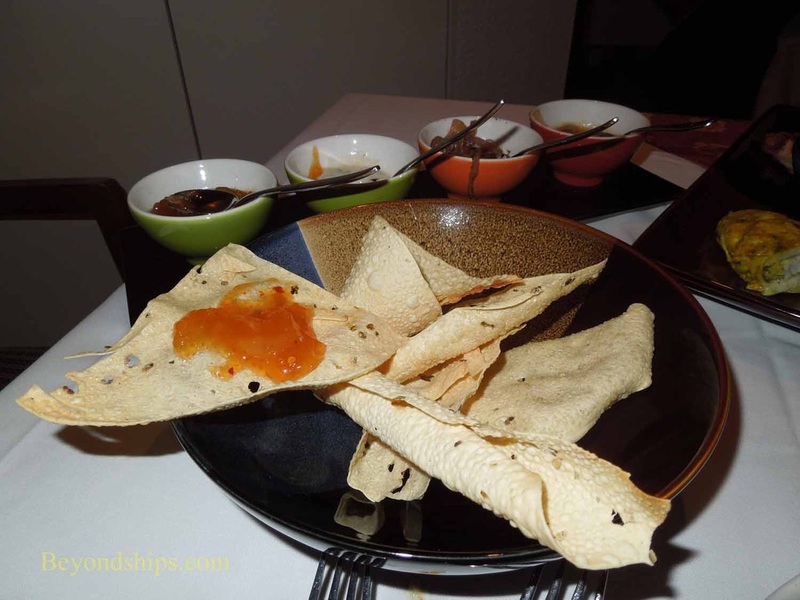 Some additional spiciness can be found in the mango chutney that is one of the sauces that accompanies the papadums. Those who prefer more spiciness can use the chutney as a condiment throughout the appetizers and the main course. You do not have to decide which appetizer to order as all of the appetizers listed on the menu are presented as a tasting plate. All were tasty but mild if eaten as presented. 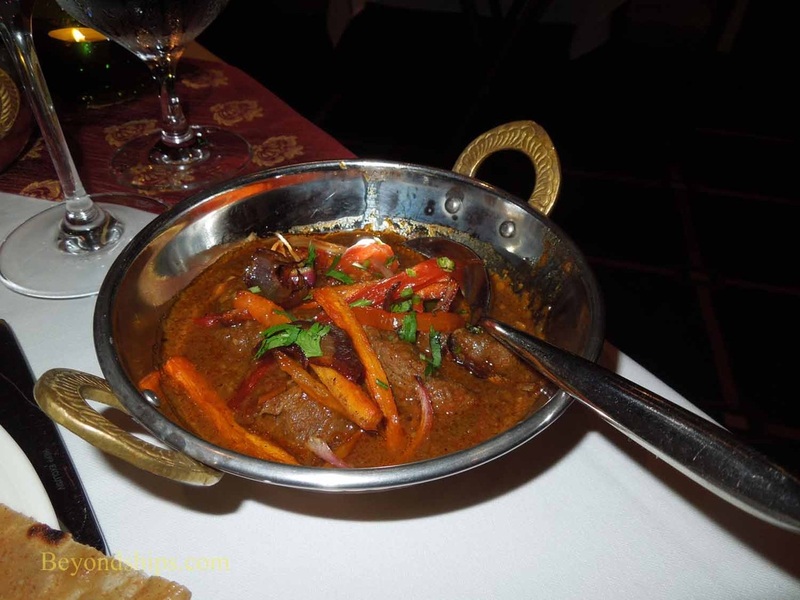 For the main course, we selected Lamb Jalfrezi. This was nicely presented in its own skillet. It consisted of tender chunks of lamb bathed in a brown sauce flavored with onions, tomato peppers and cardamon seeds. Very tasty. All of the main dishes arrive with Paratha and Basmati rice. 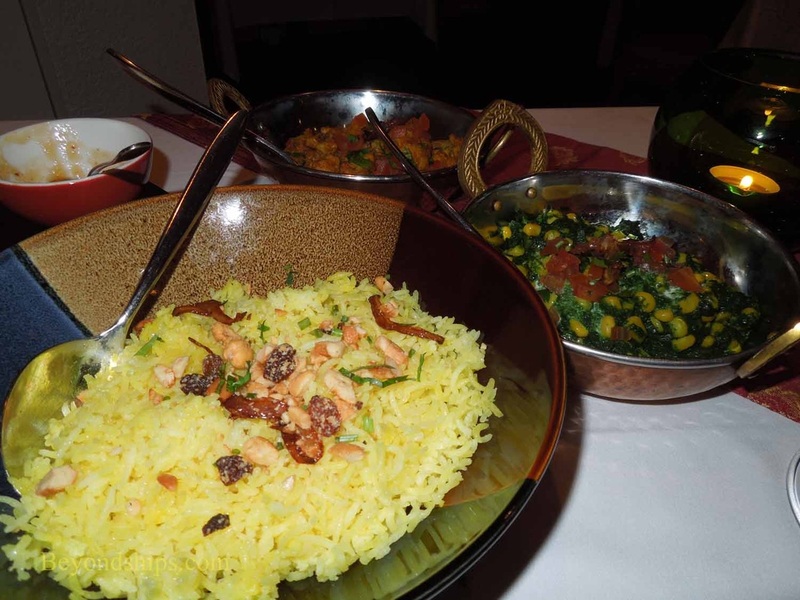 You also have a choice of three side dishes of which the sweet corn and spinach mixture (Makai Saagwalla) was the most memorable presenting a sweet contrast to the spice of the main dish. The potato and cauliflower dish (Khatte Teekhe Alo Gobi) was also interesting. Service throughout the meal was prompt and congenial. The tables in this venue are mostly tables for two and so there is an opportunity to quickly develop a rapport with the staff. There is a ten dollar cover charge for Coriander.